This reviewer borrowed the book from the public library. 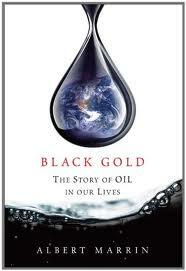 In Black Gold: the story of Oil in our lives, Albert Marrin writes a captivating history of how our dependency on the thick and slippery stinky stuff has influenced our civilization in ways that are less than honorable. "Oil influences every aspect of modern life. It has helped shape the history, society, politics, and economy of every nation on Earth." Marrin begins with the science of how oil developed, from the tiny life forms called phytoplankton between 10 million and 260 million years ago, and covers its uses from ancient times through the present. He thoroughly explains oil’s discovery in the late 1880’s, its many uses to the countless wars started in hopes of controlling the oil fields in the Middle East. Any book on the topic of oil must also be a wake-up call and Marrin makes it clear that our reluctance to decrease our dependency on fossil fuels will soon (very soon) have a cataclysmic affect on society, humanity, and the world. As oil reserves dwindle, and it already is happening, more and more wars will be waged to control the ever dwindling supply. "You may have men, munitions, and money, but if you do not have oil...all your other advantages would be of ...little value," says Walter Long, friend of Winston Churchill (no quotation mark) at the time of World War One. The final chapter, Toward A New Energy Order, explores the pros and cons of the leading solutions to the oil problem. We all know it won't be easy to lessen our dependency on oil, and there is no easy solution. No matter which path the world explores, people will need to make sacrifices. "We have no choice. Time is running out." The book is well-documented. It includes source notes, a glossary, image credits, and index. Black Gold should be in every library and included in displays on a variety of topics, including Earth Day, Arbor Day, and Global Warming. I do a writing unit on environmental issues with my sixth graders and this would be a wonderful research resource. Thank you! Before any of us can make an educated opinion on our energy future, we need to fully understand the resources available and the costs associated with each of them. Kids need more information than TV soundbites for such important topics. I can't wait to read this one. If you're looking for an excellent middle-grade, nonfiction book on nuclear power, try Dr. Fred Bortz's Meltdown! The Nuclear Disaster in Japan and our Energy Future.